This image was made on an October morning while shooting on a fall foliage field trip, visiting a number of locations in southwest Vermont. Our guide was the distinguished nature photographer, Joseph Rossbach, who is also a writer for Outdoor Photographer and other publications. 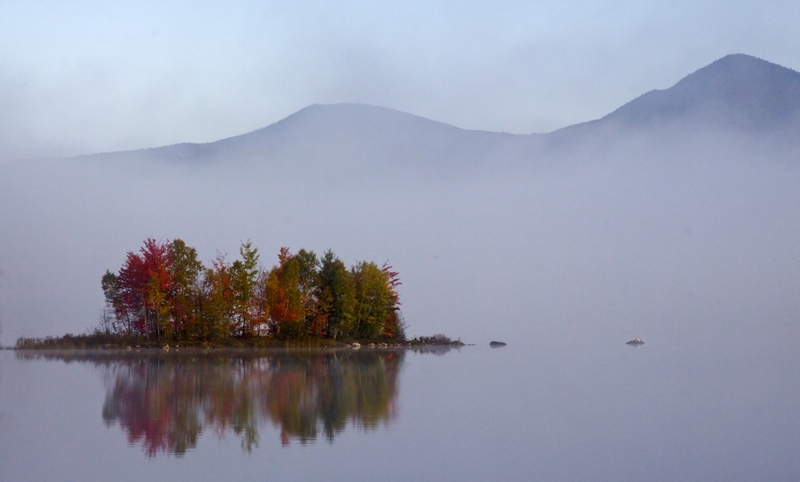 The Chittenden Reservoir was our destination for both early morning and twilight views. In addition to the reservoir there is an associated pond, Lefferts Pond. The reservoir and the pond provided a number of beautiful locations and scenes, from the morning lifting of the night’s mists to the dewdrops on a spider web on a trail bridge, to the melancholy tones of twilight. All were made more dramatic and appealing by the fall colors. For this scene I tried a number of frames, some with a wider view, and some narrower, even down to the near shore pebbly bottom under cloud reflections. Some other images from that field trip (including that dewy spider web) can be seen by clicking here. The reservoir and Leffert’s Pond can be seen on a map by clicking here. The winners and other finalists of the 2012 American Landscape competition can be seen by clicking here. That is so wonderful! I will keep my fingers crossed for you!! Congratulations Ralph — how wonderful! You already know how I feel about this image — it is still a WOW! Congratulations! I just love that image. I’ve loved that image since you first showed it at the club. Great job, Ralph! Excited for you! Great picture. It looks a lot like the small island on 2nd Roach pond where we all camped in younger days. I think I hear a loon. Congratulations, Ralph – lovely simple image with relaxing mood. Big standing CLAP…. what a prestigious group you are included in. That truly evokes calm and beauty. Taken in the perfect light. Heads up, you got my vote on the OP site. That is terrific Ralph!! What a beautiful and peaceful image. Best of luck to you – but you shouldn’t need any luck with such a lovely work! What an artist! All the pictures are gorgeous. Marilyn F.
How wonderful Ralph, this is a gorgeous image!!!!!!!!!!! Your’s is the most beautiful. Just got online and saw your wonderful photograph. It’s an amazing and thoughtful picture. Congratulations and we’ll keep our fingers crossed. You deserve the win.